Scott, Nikhil and I awoke to find the Swantaranta express running two hours late (which in Indian for on time, I believe) and that Scott had caught a case of what we might not so affectionately call the “Agra hustle.” Though Scott seemed to be recovering rapidly, the my dear partner in crime needed sleep and water to replenish his strength. We knew not exactly where we were to be staying in Varanasi, but had been in contact with a local ashram, recommended to us by a Mr. Oliver Daly who had, for some time, been occupied there. As we exited the cool comfort of the train and immersed ourselves in the grimy heat of Varanasi, it was decided that this Ashram would be made our first waypoint in the city. Nikhil quickly propagated through the crowd of touts and rickshaw drivers, which filled the train station, collecting along the way one fellow who was to be our driver for the day. Nikhil and this driver lead us out into the packed dirt parking lot. The air smelled strongly of woodsmoke, in addition to the normal Indian cocktail of scents: open sewers, cooking spices, and pan. Ah, pan, I don’t know if I have yet described to you this most singular element of Indian life. And indeed at this point in our tale, I was rather ignorant of the stuff myself. I knew of it only these 3 things: it was made of, among other things, beetlenuts and beetle leaves, it caused a large amount of deep red salivation to occur in the mouth of the fellow who imbibed it, and smelled distinctively and strongly enough to play a leading role in the already quite savage Indian bouquet. Through this bouquet we barreled, in an ailing autorickshaw, which our driver started by jerking a great lever on the floor of the machine, and which –we found out when he stopped mid-trip to buy 40 rupees (~$1) of petrol– required motor oil to be mixed with it’s fuel. The streets of Varanasi were crowded, but filled much more predominantly with bicycle rickshaws and cattle than motorized traffic. And what motorized traffic there was tended to be either large machinery (dumptrucks, etc.) or auto-rickshaws. We arrived first at the Little Stars School, which was located some distance from the city center, in a more residential neighborhood. We were greeted warmly there and upon learning of Scott’s illness, Asha, who heads the school, offered to make a healing rice and lentil mixture to sooth his stomach. In addition we were told that indeed we would be welcome at the ashram, located farther downstream, on the banks of the ganges. I will once again let pictures speak for the beauty of that place. And eclipsing even the beauty of the premises itself, was the kindness and welcome with which we were received there. All there walked barefoot on the fine marble floors, and every time I passed another person within the walls of the ashram, I was acknowledged with a pressing of the hands together, a slight bow of the head and the word “namaste.” I later found that this word was a reference to the god, and the oneness present in the two exchanging the greeting. It felt good. We were told our room was being prepared, and we were offered spicy milky tea and food. When our room was ready, Scott proceeded to sleep vehemently. Nikhil and I retired to the ashram dining area where we sat crosslegged on wooden boards, and ate a monstrous traditional indian meal from gleaming stainless steal plates.With Scott out cold, Nikhil and myself decided to take in the city on our own. We exited the gates of the ashram where our driver had, at our request, been waiting. We found him sitting overlooking the great river and smiling. 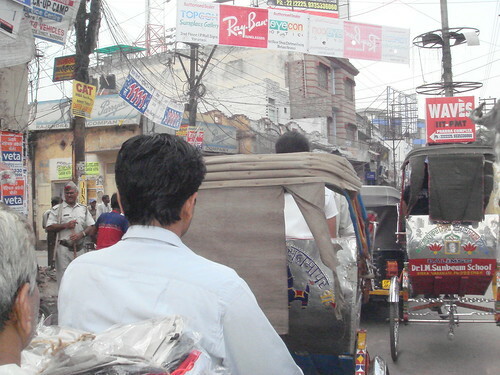 We piled back into the rickshaw and off we went. The whole while I was transfixed with the bizarre world of Varanasi. It was a feast for the eyes: dogs, cattle, oxen, buffalo and crows roaming the streets; brightly dressed women, in dramatic sarees of fine silk; men in stark white gowns and large turbans; men sleeping on piles of brick; children digging sewage from open gutters; bicycle rickshaws carrying absurd loads of brick, or piping, or oil cans; groups of 4 or 5 people crammed on a tiny motor bike, men with their heads wrapped in linen, so that only a slit remained from which to see; and women wearing all black, with a black covering for the head which had no� slit through which to see!, but yet they strode confidently through this amazing traffic. During my transfixion, Nikhil was talking up a storm with our driver, a very fine gentleman by the name of Babaloo Baba, who it seems had now taken a partial role as tour guide in addition to our driver for the day. Our first stop was at a house of fine silks. Babaloo Baba turned onto a narrow cobblestone lane which bounced the little rickshaw quite terribly. Nakhil explained to me how it was done inside such a place. “We must look at many things and find a number of things that we are interested in. These will go in a pile, which later we can pare down to those we actually with to purchase.”And so it began. We removed our shoes and entered the ancient building. We sat cross legged on a giant mattress, which extended to all four walls of the room. All around us were placed the most intensely colored, beautifully patterned, and most elegantly textured fabrics I had ever seen, or for that matter, can even conceive the existence of. The owner of the shop, a rounded man in a deep orange silk shirt, sat with us ordering around a small harem of young boys which fetched silks so that he could dramatically unfurl them before us. We hemmed and hawed, chose a pile of things and then Nikhil went into intense haggling mode. His face turned to a sorrowful frown and he began to peer into his wallet shaking his head while saying very many things in hindi, not the least of which was “student”, and “nay nay nay”. After some bargaining, we finally agreed on a price and the man set his minions forth packaging the silks in little blue plastic bags, which were then covered with tape and cryptic ball-point pen. The entire parcel, which has some surprising weight to it was then placed in a larger bag, while Nikhil went through the process of paying with a credit card.Silks in hand, we were then taken by one of the boy minions on a tour of the silk manufacturing operation. This consisted of many men in dark stone dwellings, located throughout the tiny winding streets of Varanasi. We invite you to see for yourself.Next, Babaloo Baba most verbosely drove us to a temple. At the entrance gate, we removed our shoes, cellphones, camera, matches, and anything else which might be used to defile the place, and proceeded to walk through the metal detectors. On my way through, they discovered a USB key drive in my pocket, and having never seen one before, promptly confiscated it (Nikhil was able to retrieve it upon our leaving). Inside the temple was filled with monkeys, laying around, playing with each other, or eating bits and scraps from the vicinity. I followed Nikhil through the temple. He approached a number of kiosk like stone booths, decorated with flowers and offerings to the gods, and covered with elaborate engraving and statues. At each of these, he was performed a kind of spiritual transaction, which involved a small ladelfull of a holy water. The water was poured into his open hand. Some of it he drank in a quick slurp, the rest he smoothed over his hair. Also at the temple was a giant tree, which must have, at some point, been submerged in earth much farther up its trunk, for now many long roots hung from the hulking trunk which, some 3 feet above our heads, bulged out to twice its size at foot level. All over this tree were strings and ribbons fastened there in the name of wishes, in hopes they would be later fulfilled by the gods associated with this temple. In the event that these wishes indeed came true, an offering would be made at this temple in thanks.As we left the temple, a glance at the watch showed it was getting near time to return to Scott’s side. “Just enough time to have a pan,” Nikhil said. So Babaloo Baba drove us to a pan man and I began to marvel at the manufacture of this strange item. A man sat cross legged in a little alcove in a crumbling wall, near a busy street. A crowd was gathered there and he was furiously manufacturing pan, and Indian man were eating it up just as fast. First a pan leave was taken from a large pile covered partially with a torn piece of burlap. 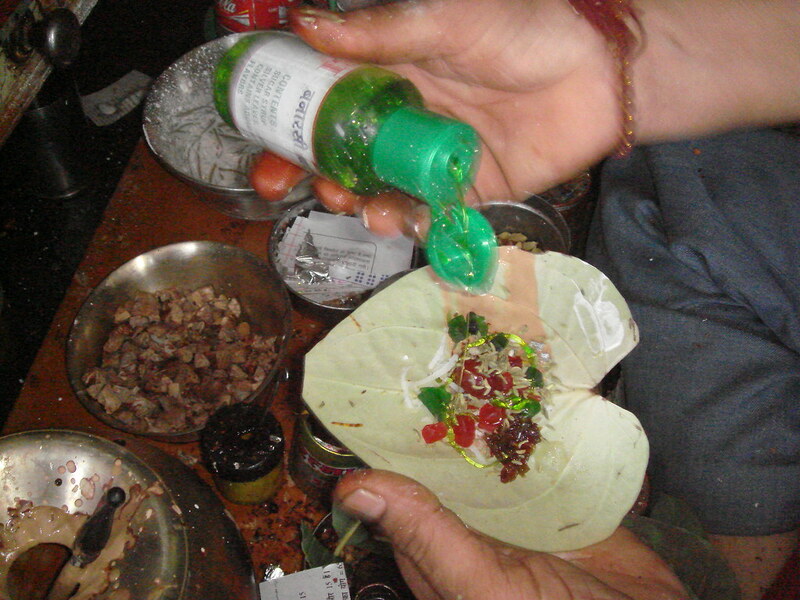 Then, from a vast array of tiny jars and metal tins, he began to fill the leaf with a sprinkle of this, a sprinkle of that. And for the time, I genuinely enjoyed the flavor. I cannot describe it any better than to say it was sweet, strong, and tasted distinctly red. I spoke through the mouthful redness, “so I just swallow it?” Nikhil nodded. Perhaps the act of eating the pan had endeared him to me, or perhaps he thought the the pan would impair my ability to cross the street, regardless, Babaloo Baba now grabbed my arm and lead my through the onslaught of scooters and rickshaws to our vehicle. As we drove back I felt the pan in my stomach unpacking its tools and getting to work. As Nikhil explained to me, “muscles in your stomach that have not been used in a very long time are grumbling, saying ‘what is this stuff.’” Indeed… indeed. This entry was posted on Sunday, June 22nd, 2008 at 7:19 am and is filed under India, Pictures, Uncategorized. You can follow any responses to this entry through the RSS 2.0 feed. You can leave a response, or trackback from your own site.